The Q5's most significant competitor in the segment is the X3, and that SUV, much like the Q5, hasn't done too well for its parent brand. Yet together these two SUVs hold up the segment and create whatever little excitement there is until I expect Mercedes comes in with the GLK and prices it competitively. This second generation X3 is technically no longer new as it was launched in 2011 as a refreshed model. Yet, not having seen this specific design on our roads too often means it still gets some attention from passerbys. That attention is however not a reflection of whether it looks good, or not. In my opinion it's a non-inspiring design, something that you wouldn't feel very passionate about. Despite the upside down lip on the front bumper or the flowing shoulder line that runs from the front fender to the tail lamps, the overall image is purely of a sedan raised on a very high platform. It's not imposing neither is it handsome and that alienates it for consumers. Having said that, neither is the Audi Q5 a very handsome design! It too lacks the personality that should draw attention to it. As mentioned in the previous test, the Q5 sits between the Q7 and the Q3 but lacks the persona that either possesses. I couldn't make up my mind about which is the better looking of the two from the outside and I'd look entirely elsewhere if styling was top of my shopping list (Volvo XC60). Step inside the cabin of the X3 and what you see is a fairly rich, well-built ambience that is typically European. It's standard BMW styling with a two-tone palette that gives it a refined and sophisticated feel. Yet in places the leather feels more plastic and lacks the richness of the Q5. The control knobs don't stand out as distinctly in the X3 as they do in the Q5 and the look and feel of the dashboard is much more luxurious in the Q5 than in the X3. Where space is concerned, the X3 comes out a bit ahead of the Q5 with more knee room for rear seat passengers as well as more shoulder and head room. In the BMW you also sit more upright which adds to the feeling of space. One critical plus point for the Q5 is its panoramic sunroof which offers a larger glass area, enhancing the sense of space. Another interesting observation is that the armrest in the middle of the rear bench is placed lower in the X3 than in the Q5. Why this is important is because in the X3 it feels more natural and therefore makes the seating position more relaxed. Score one for the BMW's ergonomics then. The X3's centre console also protrudes into the rear passenger cabin lesser than in the Q5 making it less intrusive though in terms of functionality they both offer only air-con vents, a small cubbyhole for loose change and toll receipts and a charging point. Both SUVs are extensions of sedan platforms, the X3 is based on the 3 Series and the Q5 on the A5 coupe. That means you get fairly composed dynamics and stable ride quality as is expected from any monocoque. There are pros and cons to both though. The X3 has better handling abilities with a more 50:50 weight balance over both axles but in order to gain that superior margin the ride quality isn't comfortable because the suspension is stiff. It's not stiff enough to apply all the standard clichés to, yet it's stiff enough to make it uncomfortable. And it positively makes the Audi feel like a magic carpet ride. The Q5 has retuned spring and dampers in its latest avatar and it's better suited for the roughness of our roads. Ground clearance in either SUV is almost the same which translates into poor off-roading abilities and you really shouldn't be trying to get into sticky situations. Both SUVs also offer drive selection modes that alter suspension, steering, engine and transmission character though only the X3 allows you to completely deselect traction control. Both SUVs also employ electromechanically assisted steering units which is in the interests of efficiency but both differ in nature. Where the X3 is lighter and more sensitive at slower speeds, the Q5 seems heavier at all speeds. 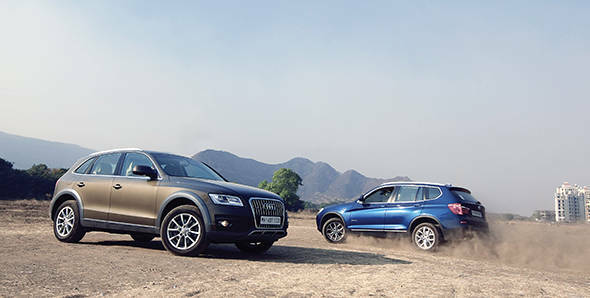 With the drive selector on the dynamic mode the Q5 feels the heavier of the two but also feels more direct. On test with us was the X30d, the more powerful of the diesel options available in the X3. The 2993cc in-line 6-cylinder engine puts out 261PS at 4000rpm with 560Nm of max torque available between 2000-2750rpm. By itself this is a very refined engine and with the windows rolled up it almost feels like a petrol except that its redline is near 5500rpm. That and the exaggerated throb when you crank up the engine are the only giveaways that it's a diesel. Throttle responses are sharp and the X3 feels quick to accelerate, its turbocharger also kicks in slightly earlier than the Q5 though this more of a seat of the pants feel than absolute numbers. Mechanically, the Q5 is less powerful than the X3 even though the engines are in a new state of tune. Its V6 diesel has less volume and consequently less power than the X3. Where it does make up for lost ground is with its torque, its 580Nm available from as low as 1400rpm, all the way to 3250rpm and gives it a bigger advantage where driveability is concerned. The Q5 is only let down by its 7-speed transmission as compared to the X3's 8-speed unit which allows it to have better performance and efficiency. Both SUVs offer automatic start/stop as standard fitment in adition to a brake energy recuperation system. However the system seems to work better in the X3 than the Q5. The X3 is quite impressive and the 3.0-litre is clearly the better engine to invest in. With better efficiency and performance, slightly better dynamics and more interior space it should appeal to those of you looking for those characteristics in an SUV. BMW already has 30 dealers spread across the country and it's growing compared to Audi's 23 odd branches which is also expanding. Yet its drawbacks are at polar extremes to the good it does, the ride quality is still not up to the mark which for an SUV that costs upwards of Rs 40 lakh spells a bad bargain. And there is a bigger deal breaker, the X3 comes with run flat tyres and no spare wheel. In our driving environment that's a big negative as it not only inconveniences owners if they have a puncture but is also a very expensive replacement. So that makes the new Q5 the winner of this test. It offers more luxurious interiors, better ride quality and from the various opinions I have sought people find its styling to be more appealing. On the performance and efficiency stakes it's so closely matched you'd ignore the difference. It's also priced lower than the X3, a mere Rs 60,000 separating the basic 3.0-litre variants. And then Audi also offers more options than the X3, there are two diesels and 0ne petrol as compared to the X3 which has just two diesels. And you have three variants in each which makes that a choice of nine Q5s. The X3 has just three variants in all. And so the Q5 prevails, but with the slimmest of margins.